We think Social Selling, the art of prospecting and engaging with customers via social media, is absolutely wonderful and we’d love to see more sales professionals use it. 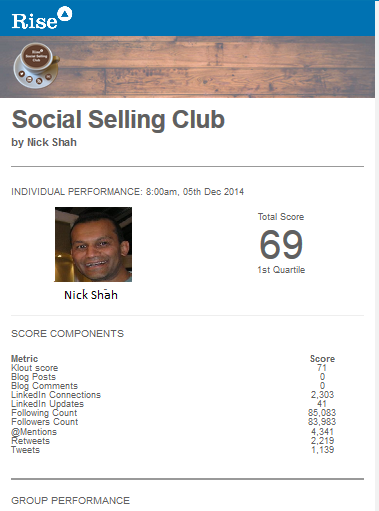 The social selling club is an opt in club to track and measure your social selling performance for free. The Internet, search engines (i.e. Google!) and online digital data (especially social media data) make today’s buyers (both consumers and businesses) hold all the aces in the procurement game. There is general consensus that a B2B buyer has completed 2/3rds of his buying process before interacting with a single vendor. This is why every business needs to embrace social media marketing and social selling. These tools allow you to position yourself so that you are the natural port of call when a buyer decides to talk to a vendor. Social selling is no different from normal selling, except the conversations and interactions happen on social media – on Twitter, LinkedIn, Facebook, Blogs, etc. The objective of social selling is to post content and contribute to conversations on social media so that your prospective customers get valuable information and advice to help them in their buying decision making. A minimum requirement for success in social selling is to achieve reach (how many people are reading your content/posts), activity (how much content/posts are you contributing on a regular basis) and engagement (are people taking notice of your content by acknowledging your contributions positively and interacting with you in conversations). You start social selling by tweeting, responding to other people’s tweets, following people, getting followers, making posts on LinkedIn, making connections, blogging. How do you keep track of how well you are doing this week after week, and also relative to other social sellers? This is where Social Selling Club comes in. We will help you keep track of all these activities and report back to you on a weekly basis, giving you a single score that will be easy for you understand how you are doing from week to week. The score will also show how well you are doing relative to everyone else in the Club. Look at the detailed data every week and you’ll be able to understand what you are doing well and where you need to do better. And the best thing is that, this won’t cost you a penny since this is a free service from Rise. So, what are you waiting for? Join now and start your journey of social selling success.